Contribute your suggestions here, Place a note if something is obvious plagiarism. [TimBray] I think there should be a textual version of the logo. Almost every font has U+00D8, O-stroke, ø. So you'd write Atøm. Or in HTML, At&#xd8;m, or At&oslash;m. Downside: People from Denmark would make a horrible strangled sound when reading this phonetically. [ArveBersvendsen] Living in a country where ø is a common letter, I find this to be a horrible idea. [PhilWolff] Should we design version numbers into the Atom badge? Atom 1.0. [JeremyGray] Great minds think alike. I wouldn't be at all surprised if everyone is already visualizing remarkably similar logotypes for Atom. We could be down to discussions of fonts, colours, line thicknesses, etc. in short order once people have seen your pngs. The font is Arial Black. (Some software has installed it on this computer, but I don't know which). The font is from The Monotype Corporation. The "o" has many possibilites for variation. This particular version was created by drawing an ellipse with height-width ratio of 2:1, with the blue proton in the middle, and the red electron at 90 degrees; - the entire image is then rotated 45 degrees clockwise; - I can very well imagine someone creating a 3d version resembling this. I looked around the web for similar logos, but found nothing that matched. Neither the AtomFilms and Atomz Search logos resemble this. [DeveloperDude, RefactorOk] I would avoid the Ellipse, which is present also in Atomz logo. [ArveBersvendsen, RefactorOk] The Atomz logo is very different from this suggestion. Plus, if you want a logo that's related to the word, it's kind of hard to avoid, since the ellipse is a common way to represent atoms. [KenMacLeod, RefactorOk] The word "Atom" against a backdrop of a molecule -- how atoms fit together. Using a "blob" style of molecule diagram, rather than a spokes-n-atoms style. Like , but by somebody more graphically talented than I. [ArveBersvendsen, RefactorOk] Any sort of complexity like you're suggesting quickly becomes cluttered, and is unsuitable at smaller sizes, and usually won't work well in black-and-white. Trust me, you want something simple. [AdamRice] Flinging this against the wall to see if it sticks. Still very rough--the "o" needs work to scale down well. I like the second one better. It just occurred to me that I have unintentionally depicted the Lithium atom, which has some amusing overtones, given the history of The Syndication Format That Shall Remain Nameless. [DeveloperDude] I really like the Lithium atom look. I'd avoid the hydrogen look (above) which could be misrepresented and the lunar look (below) which looks like planets not atoms. I hope [JeremyGray] is able to share vector art (SVG?) and an antipixel badge. There's the comic/cartoon superhero, The Atom. Astro Boy's name in Japanese is Tetsuan Atom. [FinnSmith, RefactorOk] As long as we're doing comic books... 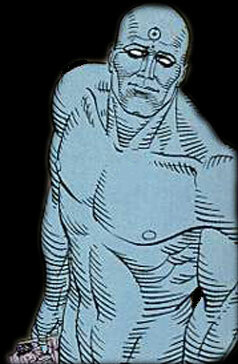 There's the character Dr. Manhattan from Watchmen. He has a hydrogen atom inscribed on his forehead. (He put it there himself after rejecting the three electron symbol the government came up with for him.) This is the best picture I could find on short notice. [NickChalko, RefactorOk] SVG version would be very nice, and make it easier to produce "correct" derivatives. [JonathanSmith] Could anyone who worked on the project be able to buy a t-shirt? Sure http://www.cafeshops.com/cp/ will print anything. [MarkPilgrim] The Feed Validator needs a "Valid Atom" logo. [MarkPilgrim] I would also like to see an Antipixel-style 80x15 "Atom Feed" logo, with a small icon of an atom and the word "FEED" in Silkscreen. [SimonJessey] All the work Arve has done is brilliant. His examples should be given serious consideration. [TomasJogin] Let's not get ahead of ourselves. Just throwing around logotypes left, right and center will leave us in the same stupid corner as the RSS "logo" is in; oblivion -- there are so many RSS logos that there is no RSS logo. Let's reach a consensus on the name first, and then a consensus on the logotype. [JeremyGray] I wouldn't be too worried about it at this point. Other than the prior art references, which are helpful, there have been (I think) only three fundamental treatments presented to date. There are far more (N)Echo/Atom feeds actually in production based on varying versions of EchoExample. Now that's something I'd be more worried about.